Scott Mattingly, 60, is one such runner. Born and raised in Catonsville, Maryland, Scott will be competing in his first ever Boston Marathon. Having only run for about 13 years, he made the switch from 5k’s and 10k’s to longer distances. His excitement is evident in the way he describes to us his training leading up to qualifying, applying and ultimately, being accepted into this year’s starting field. It has not been easy. Scott shares with us the details of his first qualifying attempt which resulted in a DNF and a hospital stay. But he came up with a new qualification strategy and secured his bib. There is much about Scott that we can all relate to: balancing a career and family with training for a prestigious race, struggling through injuries, setbacks, and the challenge of mental endurance. 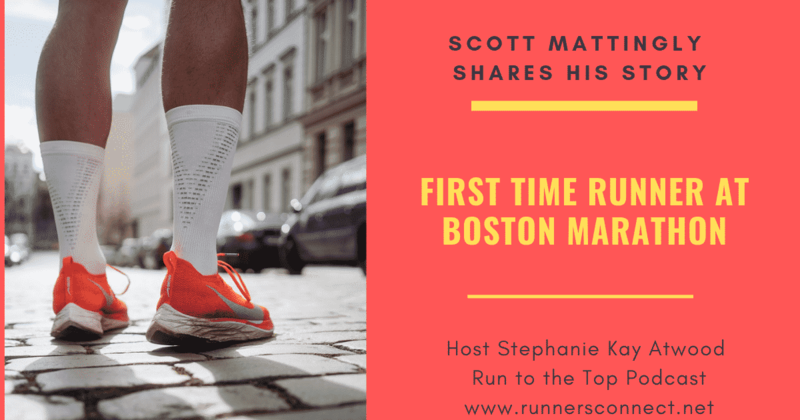 Scott gives a name and a voice to the Everyman Boston Marathoner and we will certainly be following him closely as he toes the line Monday morning in Hopkinton, MA. 2:53 Did turning 60 play into your qualifying strategy at all? 3:29 What is your background? 5:10 How supportive was your family? 6:42 What kinds of activity did you do before running? 7:34 What got you started running? 10:01 What motivated you to qualify for Boston? 11:08 What was your fist BQ attempt like? 15:03 How did that affect your next attempt? 15:56 What do you expect for weather in Boston? 16:34 How did you train for qualifying and what time did you need? 17:59 Were you training in a group or alone? 19:05 What types of workouts were you doing for training? 21:24 What was your finishing time? 22:21 What was the registration and acceptance process once you BQ’d? 23:46 Will you be running Boston with a group? 25:23 What will your running kit include given the variability of weather conditions? 28:30 What is your shoe strategy? 31:45 Have you ever run any part of the Boston course? 35:52 Is your family excited for you? 37:27 What else do you have to share with us, especially what will your nutrition strategy be? Don’t let knee pain keep you from completing your long runs, or worse, sideline you altogether. An innovative new product called NuNee can help. NuNee is designed specifically to relieve that dreaded Runner’s Knee pain. Let NuNee help you get back to running without knee pain. Available today at NuNeeShop.com. Use code RC20 for a 20% discount.